This entry was posted in Expression in Words and tagged art, ATC, drawing, heart, inspirational, life, love, motivational, unconditional love. Bookmark the permalink. wow, dis is rily nice! cheers and have a good day! your welcome, now following ur blog as well. thanks very much haha. first time painting in a super duper long time! Good work for a “first time in a long time.” I am going to do a series of articles on heart health and diet shortly. I’d sure like to use the art as a side post with credit given to you. Any suggestions? sorry, I’m not sure I understand– you want to use it to accompany your posts? or as part of a separate, related post? 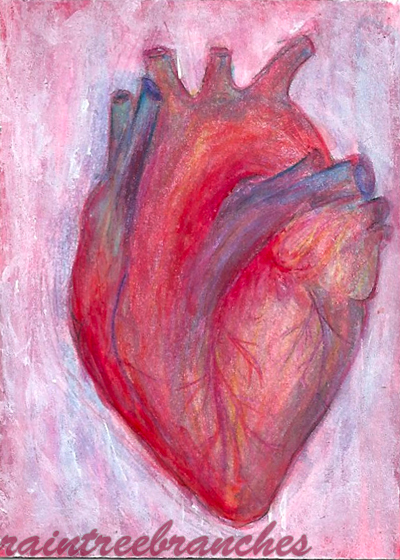 I would like to use the art to accompany my posts as they relate to heart health. Let’s face it…it’s great art. It’s soft and not scientific–in other words there is emotion to it. That’s why I asked rather than do the “standard” internet ploy of just ripping off the artist. Ha! Could you send me a jpeg and exactly how you want the credits and link? In terms of size of jpeg, sometimes I think bigger is better but I’m no techie! PS: I’ll be working on the articles shortly and will let you know when I am about to publish the series. Selfless sentiment about an emotion that all too often is all about selfishness … what “I” want … Nice job! Sweet. I was just with the love of my life, who is now married, and this poem rings true in a lot of ways. aw. :( thanks for the comment.